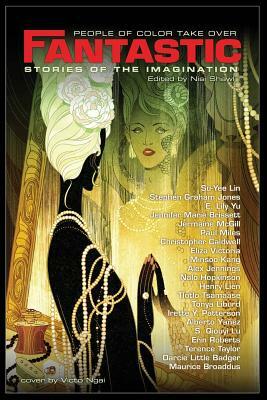 In this, the final issue of Fantastic Stories of the Imagination people of color take over Special Guest editor Nisi Shawl has assembled a breath taking array of stories by some of the best writers in the science fiction and fantasy field today, and they just happen to be people of color. People of color have been publishing some of the highest quality science fiction and fantasy since the genre's earliest days. Yet, there still persists a perception that science fiction and fantasy is somehow a white field. This special issue of Fantastic Stories should help shatter that illusion as it showcases some of the finest writer's that Science Fiction and Fantasy has to offer. Representation matters and Fantastic Stories is proud to be able to end its run on shut an important and high note. Contributors include: Su-Yee Lin, Stephen Graham Jones, Minsoo Kang, . Lily Yu, Jennifer Marie Brissett, Jermaine McGill, Paul Miles, Christopher Caldwell, Eliza Victoria, Alex Jennings, Nalo Hopkinson, Henry Lien, Tlotlo Tsamaase, Tonya Liburd, Irette Y. Patterson, Alberto Y ez, S. Qiouyi Lu, Erin Roberts, Terence Taylor, Darcie Little Badger, and Maurice Broaddus.